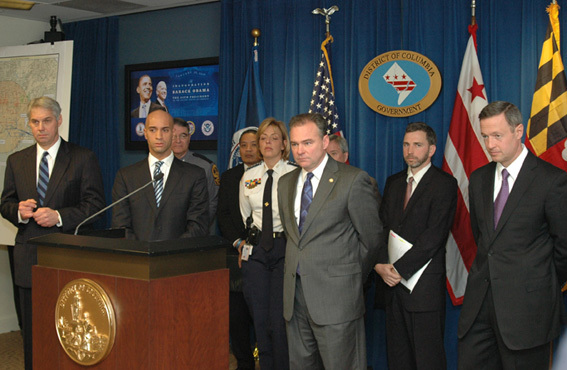 Jan. 13, 2009--Officials including Director of the Secret Service Mark Sullivan, DC Mayor Adrian Fenty, Virginia Governor Tim Kaine, and Maryland Governor Martin O'Malley briefed reporters on the progress of planning for the Inauguration. Sullivan said security will be at "an extremely high level" and noted that this is the biggest event in his 25-year career. Because the Inauguration is a designated National Special Security Event (NSSE), the Secret Service is the lead agency. All told fifty-eight agencies have been involved in the planning. A fair number of reporters' questions focused on transportation. Last week officials announced that no personal vehicles will be allowed to travel from Virginia into DC on January 20 starting at 3 a.m.. Gov. Kaine said the plan was "made by a collection of officials working together" and was "very carefully thought out." Another question concerned the number of charter buses expected. There had been suggestions that as many as 10,000 buses may show up. According to informartion provided by the DC goverment, through January 12, 2,280 spaces had been reserved, but officials said that number has been increasing exponentially. The cost to District of Columbia, Maryland and Virginia governments for law enforcement, fire and EMS and transporation during the Inaugural could exceed $75 million (letter). Department of Homeland Security Secretary Michael Chertoff had been scheduled to attend this press conference but instead participated in an exercise at the White House.